K911ResQ hasn't added a story. Anyone who knows me, knows about my love for animals, particularly for dogs. Since my TV news career started in 2004, somehow I️ gravitated toward working with local animal rescue groups doing everything from volunteering time, helping with fundraisers, doing stories on TV or emceeing events. Over the years the thing that weighed on me the most was seeing our shelters FULL of animals. Whether they were being dumped by their owners or ended up there as strays, I knew many of those animals who deserved a happy, healthy life would never make it out. They would be killed for “space” as they say. I follow dozens of animal rescues on social media and donate $10 here and $20 there to help, but I knew I wanted to do more. I want to help solve the problem of pet overpopulation. The solution is spay and neuter. It’s that simple, but it’s not cheap. Remember Bob Barker reminding you to “help control the pet population-have your pet spayed or neutered” at the end of every The Price Is Right episode? That famous quote is a matter of life and death for thousands of animals. After realizing that complaining about overpopulation wasn’t going to change it, I decided to do something about it. That meant raising money to get an RV and start a mobile spay & neuter clinic, and going to low-income neighborhoods to help families who can’t afford the surgery or who don’t know how important it is. My mission is to raise money for a mobile spay & neuter clinic and to assist low-income pet owners with vet bills so they can keep their pets in their homes and not end up in a shelter. According to the ASPCA, 670,000 dogs are euthanized in shelters across the country every year. I believe that we can save thousands of lives if we can keep dogs out of shelters. This can be done by spaying and neutering our pets. 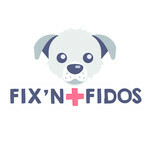 We want to ‘Fix all the Fidos’ out there to prevent unwanted and unexpected puppies. K911ResQ hasn't posted any updates yet. K911ResQ is managing the funds for this campaign.